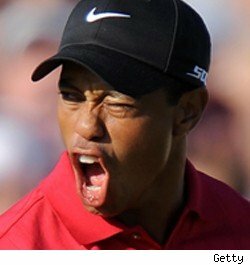 Tiger Woods is a hog. According to the Orlando Sentinel, 129,000 gallons of water goes down the drain on Tiger's Florida estate every month. Average water usage is 10,000 gallons a month. The home is in south Orange County -- and several of his fellow Floridians also spurt like mothas. NBA star Grant Hill used 263,000 gallons in May. The Magic's Dwight Howard's estate soaked up 189,000 gallons in July alone. According to records, Woods is near the top of the 25 biggest guzzlers in Orange County, Florida. Number 25 on the list averages 84,000 gallons a month. Note to Tiger -- Central Florida is in a water crisis. What If These Two Could Produce a Child?